Your design style should be versatile, and assets will look very different depending on whether you're working with a more traditional B2B brand vs. a consumer facing account. I've learned a lot working with agricultural clients, so let me plant some seeds you should bear in mind when designing for agriculture. First thing first, who are you designing for? Like any project, dig deep, do your research and understand the personas and habits of the multi-faceted world of agriculture and agri-marketing. Whether you’re creating a brand or working with one that is already established, you need to consider a few very important things. The personas that you are targeting in the agriculture industry will greatly affect all of the creative elements that you design. Growers may respond better to more digestible pieces that can be glanced at to deliver content, while agronomists and botanists may want all the technical details to be displayed with metrics shared in an organized fashion. Finding that balance involves a lot of research before diving into design. Ask questions and learn from the client and your project team. Knowing everything you possibly can about who the content is intended for is critical when creating impactful designs. Designing pieces that the target audience will actually respond to can also be done with design elements like color palette, imagery, and typography. When choosing a color palette for the agriculture industry, don’t go too over the top. Think organic with maybe an accent color to draw people in and avoid choosing a palette that clashes with the imagery you choose. Your color palette and imagery should work together. With that said, imagery can be one of the hardest things to choose for this industry. For me, when I go to the store, I choose the nice looking tomato with no bruising and not too squishy. For agriculture clients, I choose the tomato that’s got a little soil on it, probably still in the field and connected to a vine, and might have a little bruise to give it some character. Thinking outside the box is especially important when creating standout deigns. You won't always have the option to use original photographs for each asset, and I quickly learned that there isn't always a wide spread of images available for every crop, pest and iteration. You begin to get very specific and those in the industry can spot image discrepancies that may not be noticeable to the untrained eye. As a general rule of thumb, communicate with your clients about the specific imagery and stylistics they prefer before you get too far into design. Fellow designers and agency graphic designs are used to shifting gears often and working with a wide variety of industries. Personally I get really pumped when I’m designing canola all week, but that’s not every designer. Luckily, there are ways to take super technical or wordy content and typographically represent it in a way that is interesting and easier to comprehend. This can be done with icons, bulleted lists, call outs, and text blocking. Remember to refer to your personas when tackling all of these design tips, as some personas may not respond well to an “overly-creative” design. 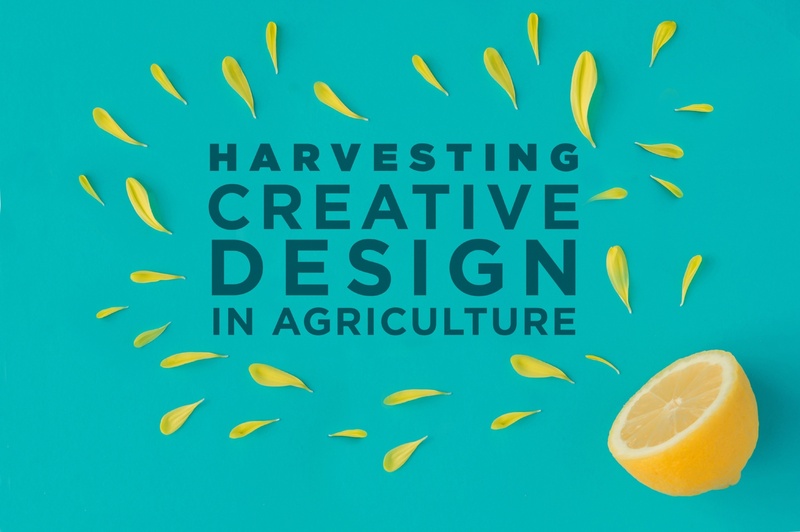 Now that we’ve established that I’m a total design nerd who spends a lot of time researching plants, vegetables, fruits, and soil… I will say that I’ve learned more about agriculture while designing here at Stratagon than I’d ever expect. Also, writing this blog made me realize that I need to water my aloe plant, Succleberry Finn, when I get home. To see some of our agriculture design projects, check out our Growing Leadership in Agri-Marketing blog where we discuss our Regional Best of NAMA awarded design.